How do contact Preferences and Property Alerts work? Contact Preferences allow you to record information about the type of property someone is looking for in your database. Once a contact has preferences saved on their record, this information can be leveraged in other areas of the software to market your properties and help with listing presentations. Where are buyer or tenant preferences located in Eagle? 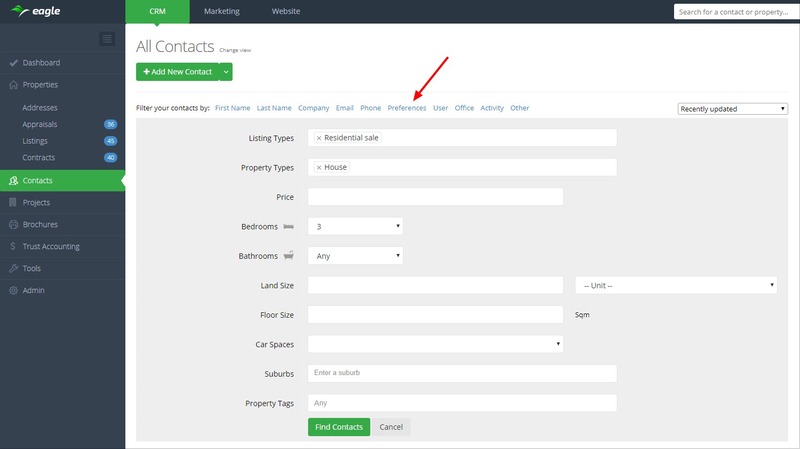 You can find/manage buyer or tenant preferences by clicking into a contact record and going to the 'Preferences' tab. How are buyer or tenant preferences created or updated? Eagle creates contact preferences automatically from property enquiries (through major portals or your Eagle website) and by logging inspection attendances with the mobile app. Preferences continue to update as the contact enquires or inspects several of your properties. For example, if someone enquires on a 3 bedroom and 4 bedroom property, the preferences will now have a range of 3 to 4 bedrooms. You also have the option of updating preferences manually on the contact record. This allows you to accommodate buyers or potential tenants with very specific requirements like a certain block size, suburb or even match on property tags that you create like 'double story' or 'swimming pool'. How do Property Alerts work? When Property Alerts are turned on, the software will check every few minutes if you have any current listings that match the contacts preferences. If a new listing is added and there is a new match, the software will automatically send a courtesy email to the contact to let them know about the new listing. This can be quite a powerful marketing tool with no extra thought, time or effort required from the listing agent. 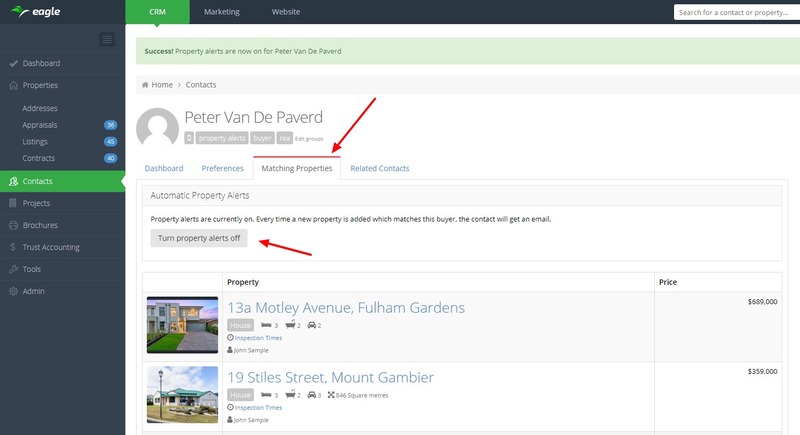 You can also easily see which contacts are receiving Property Alerts as they will be added to the 'Property Alerts' group in the CRM. How do I filter contacts based on their preferences? On the main Contacts page, there is a filter at the top of the contact list called 'Preferences'. Click on this and extra fields appear so you can filter based on the exact preferences you enter. Once you've finished filtering you can click 'Select All' which will bring extra options to manage those contacts which include adding them to a group, sending a bulk email or SMS or generating a call list. Once Preferences are saved on a contact record, another tab called 'Matching Properties' appears which cross matches the contacts preferences with your current listings. On this page there is also a button 'Turn Property Alerts On'. When Property Alerts are enabled, the software will automatically email the contact with any listings that match their preferences. There is also an Automation step for turning property alerts on or off. So for example, you could automatically turn property alerts on after someone inspects a property, then automatically turn it off after 3 months by adding a 3 month wait rule in that automation. Please contact us if you'd like assistance with setting up automations. If you click into a listing and go to the Marketing tab, you will see a contact list called 'Contacts matching this property'. This allows you to view the matching contacts, or send a targeted email or SMS to these contacts to let them know about the new listing. 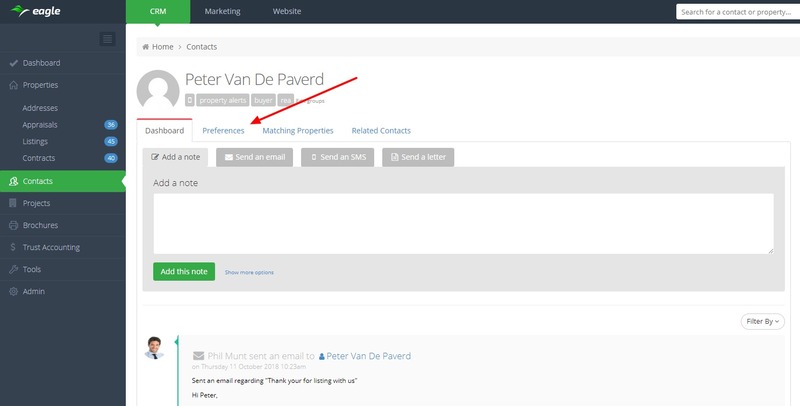 When you create an appraisal, in the right sidebar there is a button 'View Matching Contacts'. This will take you to a list of contacts whose preferences match the appraised property. This information can be quite powerful in a listing presentation to give your prospective client an idea of how many interested buyers/tenants you would market their property to if they list with your agency. There may be certain scenarios where you would like Property Alerts to switch on automatically. One common use case is after contact attends an inspection. To add this, navigate to your Inspection Attendee automation (found under Tools > Automation), then click 'Add a new step' at the point in the automation where you would like the Property Alerts to start, then select 'Turn Property Alerts on'. If you'd like the Property alerts to switch off after a certain period of time, add a 'Wait' step and enter your desired wait time (eg. 3 months), then add another step to 'Turn Property Alerts off'.